Lehigh Cement Company, a subsidiary of Lehigh Hanson, Inc., began operating in Indiana in 1902. 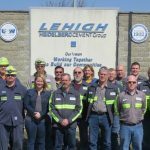 For more than 116 years, Lehigh Cement Company has been an integral part of the Mitchell community and has played an important role in strengthening the local economy, supporting community interests and supplying portland cement for local and regional construction projects. Lehigh Cement Company employees are proud to serve as this year’s Co-Grand Marshalls for the Persimmon Parade and we remain committed to being a valued part of the Mitchell community. In 1887 brothers John and Samuel Holmes opened Holmes Brothers Grocery Store on Main Street in Downtown Mitchell. Wendell Holmes (John’s son) converted the business into a Hardware store in 1928. Wendell’s son in law Don Caudell Sr. joined the business in 1952. Don Caudell II started working part time at age 14 and continues to operate the business. The business located in the same building for 131 years, continuing to serve and support our community. 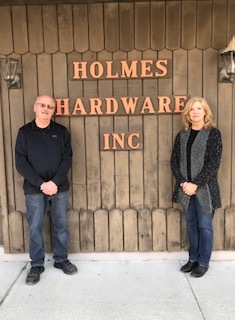 Holmes Hardware was one of the original sponsors when Little League began in the early 1960’s. The business has been a leader in donating to community causes, sponsoring events and sport teams for many years. The company is a life time member of the Mitchell Chamber of Commerce. Wendell, Don Sr. and Don II have served as General Chairmen of the Persimmon Festival for a total of 6 years. Four Generations of The Holmes Family has been proud to serve the citizens of our community and is humbly honored to be a parade grand marshal.